You are here: Home / FREEbies / National Doughnut Day FREEbies! 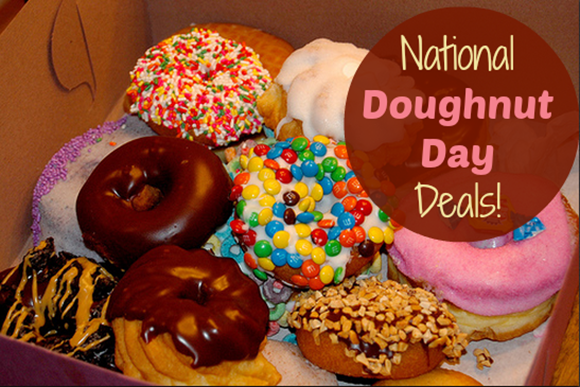 Tomorrow, Friday 6/5/14 is National Doughnut Day! Here are the FREEbies available tomorrow! Participating Dunkin’ Donuts restaurants nationwide will offer guests a FREE donut of their choice (while supplies last) with the purchase of any beverage. In honor of National Doughnut Day, on Friday, June 6, stop in to any Krispy Kreme US or Canadian location for a FREE doughnut of any variety–including its world famous Original Glazed(R) doughnut. No purchase necessary. Excludes Connecticut and Puerto Rico. In celebration of National Donut Day on June 6, The Salvation Army is partnering with LaMar’s Donuts to take a bite out of child hunger. Visit your local LaMar’s Donuts location to celebrate with a FREE donut. Any donut with a hole, no purchase necessary. Stop by one of our participating locations on Friday June 6th, between 5am-12pm and receive one glazed do-nut and a small coffee- FREE! *This offer is valid at participating locations only. Offer expires on Friday June 6th at 12pm. Limit one free glazed do-nut and small coffee per customer per visit. Not valid with other offers. No substitutions. Thanks, Coupons Deals And More!